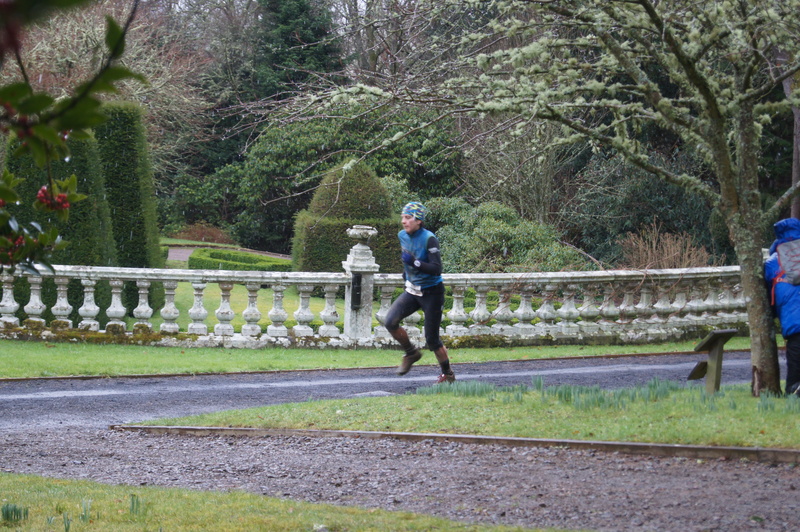 I had been anticipating this, the last race in the Bowhill duathlon series, for a while. I had won the previous two, but knew I would still be under pressure for this one. To make me even more nervous, The Adventure Show from BBC Scotland would be there filming for their next programme. Gulp. By the time we got to race morning, I was more than a little nervous. To compound this feeling, Glen was a bit late arriving, then we headed off down the A1 … which does not go to Bowhill! After a rapid correction including a sneaky back road that Andy knew, we got there not quite early enough for the good car park, but only just down the drive 🙂 . No sooner had I started queuing to register, than the camera crew asked me to go over for an interview when I was ready. They had lots of questions, and I talked a lot! As soon as I walked away I started thinking ‘why didn’t I mention …. ?’ Since I definitely remembered telling them that it was important to warm up for such a short race, I headed out on my bike to ride up the hill and down the last technical section, plus a bit of the start climb to keep warm. This also helped me to calm my nerves and ignore irrational thoughts about my back tyre going flat. I always find the mass bike start tricky but soon got into a rhythm climbing the hill. I didn’t really appreciate someone riding into me sideways, but I stayed upright. Twice I jumped off and ran steep bits before going on. 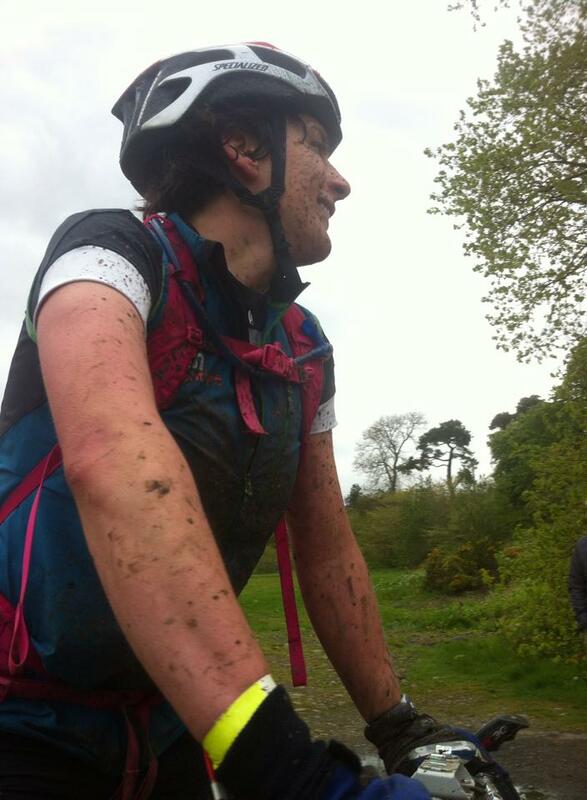 There were lots of muddy sections, as usual. Unfortunately, it wasn’t wet enough to have washed away or got to firmer ground underneath, and it was not cold enough for it to have frozen. So we were often riding through a sticky gloop that grabbed at my tyres and pulled me this way and that. I felt more anxious than usual descending. I’m not sure why; perhaps it was a heightened sense of not wanting to crash out or maybe my head was just not quite in the right place. Still, I attacked the hills and passed a few guys. At the end it got technical through the woods. I walked a short section but was then riding again. At a tricky corner, I was just about to put my foot down and scoot, when someone yelled ‘well done, keep going Rosemary!’. It was just what I needed as I thought ‘I can do this’ and rode on down :-). Into transition I knew I was first girl, but didn’t know what sort of lead I had. The film crew were there interviewing me as I tried out using a little shoe horn for the first time and got it back to front! They asked if I felt confident about the hat trick now, but I said you never know until the finish, and I meant it. Off I went, determined to run well. Despite what it may seem, I *have* actually listened to the physio. Injuring my hip has been a good thing. It made me go back to basics and build up properly. Although I’m not totally fixed yet, I’m well on the way and I’ve had several weeks of consistently running a lot more often and a lot further than I have for many years. 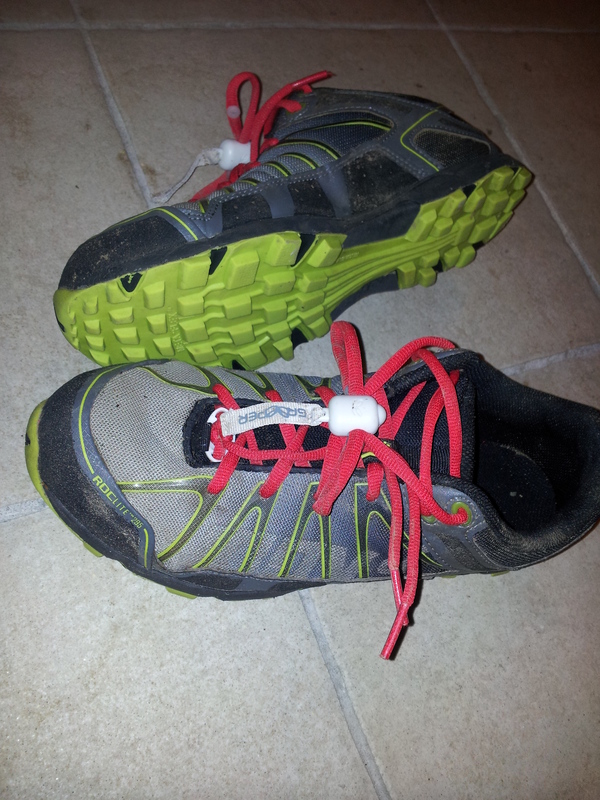 Our Ötillö race entry is also helping motivate me to keep going out in the dark and cold. Slow it may mostly have been, but it has really improved my running. The course goes up and down, then up a lot more before coming back the same way. My feet kept falling into soft muddy sections, which dragged you in just when your muscles were burning from the effect of cycling! Up we went, clambering over fallen trees and picking the best lines. I didn’t walk a step, even when it got tough. I never knew whether there’d be someone behind me spying a weakness! Lollipop. Proof I went to the lollipop handout point. I collected my lollipop at the top, waved at the cameras, noted my time and started descending. The next girls I saw going the other way were Caroline and Elizabeth. From pervious form and races, my guess was that Caroline was moving up the field and had just overtaken Elizabeth, which turned out to be the case. Last year, Caroline caught me on the descent and I couldn’t respond. This year I estimated I had about a 4 minute lead. Would it be enough? Through the trees again and a clubmate came past, nimble like the deer I had seen racing across our path earlier. I decided it was time to take a few risks and let go a bit, so I did my best to keep up with him. He was slowly pulling away, but I was actually having fun and it was enough to keep me motivated. I also got in a mini battle with a guy in red and yellow. He’d catch me on the downs only to drop back on the ups! Sprint finish, with Andy hiding by a tree! The final hill is the sting in the tail of this course. I allowed myself one or two glances over my shoulder to see if there were any Caroline-shaped people coming behind, but it all seemed clear. I wasn’t taking chances though and pushed on, even managing a sort of sprint finish. Hurrah! You want me to chat some more?? 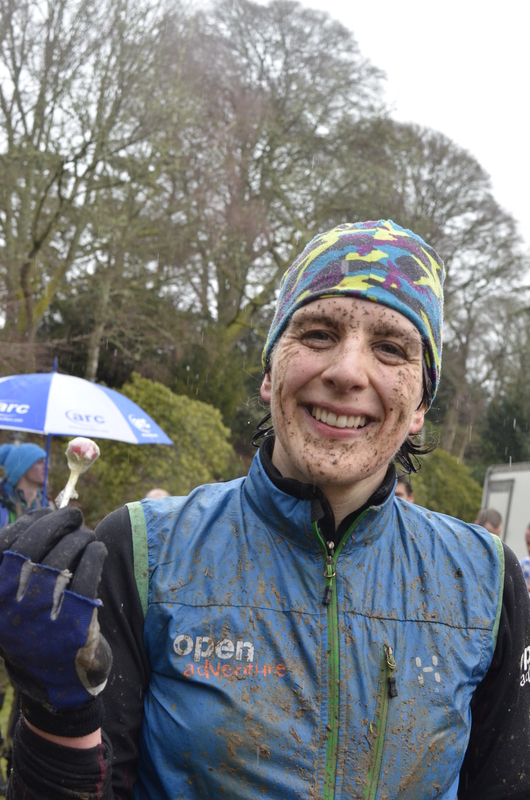 I hadn’t really noticed the rain and snow when I was racing, but got cold much more quickly than normal. I dived back to the car to strip off wet things and get warm and dry, though my lips stayed purple for ages! The post race analysis of results made happy reading. My bike time was almost the same as last year, but my run was more than 8 minutes faster. This is over a 9.6km course. Somehow I placed better (out of everyone) on the run than on the bike (by two places). This is unheard of for me! I’d like to have biked faster, but maybe I had left more in the tank to do well on the run. It can be a balancing act between the two disciplines. It’s a fabulous feeling to think maybe I could discover that inner runner again, instead of seeing it as an inherent weakness. The things some competitors do to preserve their modesty! I’d like to thank everyone at Durty Events for putting on the series again and keeping us all happy with never-ending mud supplies. Also to Glen for taxi services and various photographers. 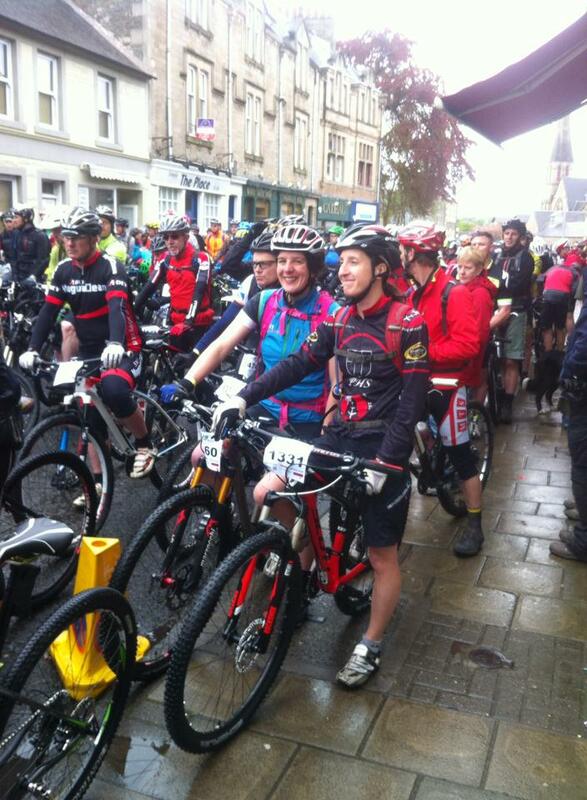 At this race in particular, I noticed loads of people cheering me on by name, even people I didn’t recognise. Thanks to you all, as it does make a difference! A great race, lots of fun, I lived up to the pressure of expectation (my own, mostly) and I left much more chatty than when I’d arrived 😀 . Full results for the race here and the series here. Photos this time from Andy Kirkland, David Hogg and RM Photography. The first race of the year! 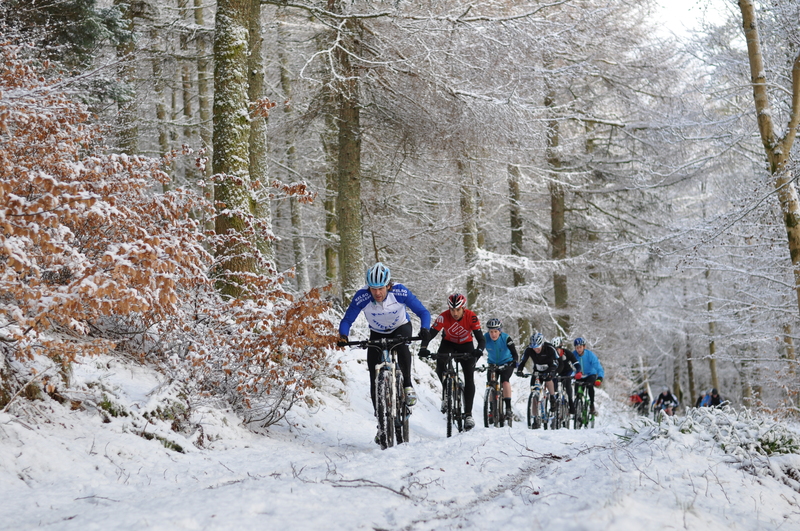 This weekend it was also the Strathpuffer 24h race which I almost got sucked into with a last minute invite … but I resisted. And so I turned up at Bowhill ready to try and repeat my performance from the short one. Speedy Jo was busy showing everyone how it’s done at the Strathpuffer (winning the female pairs), so I knew I might be the one to beat today. For some reason I felt more nervous than usual. I do get a bit stressed before the start of such short races! My tummy was playing up a bit and a short warm up ride was needed. I coaxed Glen out of the car and onto his bike – he had had one too many alcoholic beverages at his mum’s birthday party the day before – and off we went. It was cold and when it wasn’t muddy it was frozen and icy. It was nearly midday and I had timed it quite well, taking off my last two layers sufficiently late not to get cold before the hooter went. I started off to the side because I am nervous in a mass bike start as it is, without all the snow and slidy stuff on the road. I soon found my place, though it was hard overtaking on the climb when there seemed to be just one line through the snow that everyone was following. If you got stuck behind someone going just a bit slower than you wanted, it took too much effort to get off the line and plough through to overtake! Here we are riding in a line up the hill. I’m just behind German, in red, as I was for a lot of the race! A small group of us from the club had come and been round the course the week before. Although some of the tracks were easier to ride because they were now more solid, I knew the first descent was all churned up by heavy forestry machinery. Last week it was just muddy and slidy. Today all the ruts and ridges were frozen and covered over by a layer of snow. I couldn’t see what was going on and caught my wheels, falling off once and nearly repeating the trick further down. The run starts with a long, rough climb with squelchy bits. I was lucky that a club mate was right next to me. It was the motivational pull to keep me going as the path got steeper and I stuck to his heels like glue. I even went past near the top and descended the snow covered track the other side ‘somewhat competently’. At least, it felt like it, and not many people over took me. Off the tricky bit and although we could catch glimpses of the house through the trees that meant we were physically near the finish, but we still had a big loop round by the lake to do. I concentrated on doing ‘triathlon arms’ rather than ‘adventure race arms’. This means I had them high and pumping, trying to drive me onwards, instead of low and energy conserving! Easy to spot these shoes in transition! I hadn’t looked back and every time I heard footsteps and heavy breathing behind I was trying to gauge whether it was a man or a woman. Not far from the end, as we did a sharp turn, I glimpsed over my shoulder and couldn’t see anyone. I couldn’t be sure though and kept pushing on. It was like doing a Parkrun – I was beginning to feel a bit nauseous! I did want to do a strong sprint finish, but my legs weren’t having it. I got to the line, dibbed and turned round. I was clear. Woohoo! In the end I had in fact won by just over 3 minutes. I was delighted. 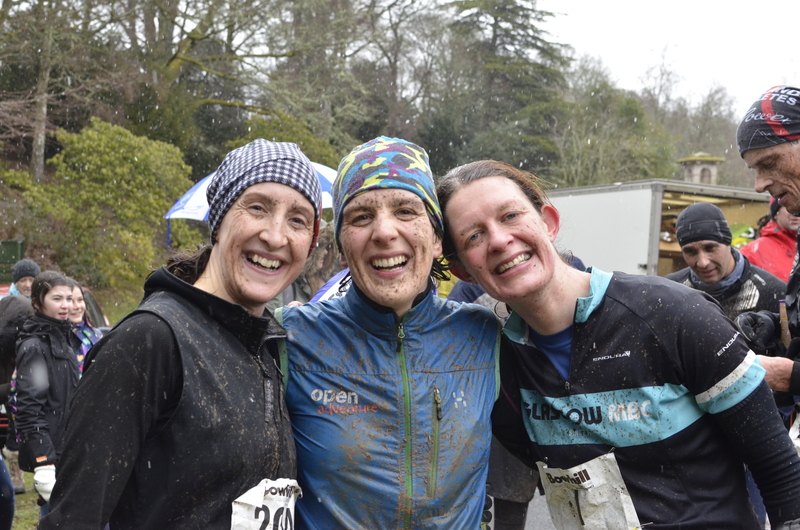 Kirsty held onto 2nd and my friend Caroline was 3rd. It’s hard to tell how times compare when course conditions change. So I had a look at the top 10 fastest bike and run times last year and this. Everything was a little bit slower this year, but my run was nearly a minute quicker and I placed much higher. Things are moving in the right direction! Full results here. 3) 5:15 average per km on run. 5:18 – just missed it! 4) Enjoy the run. Sort of, it wasn’t total hell anyway – HALF! 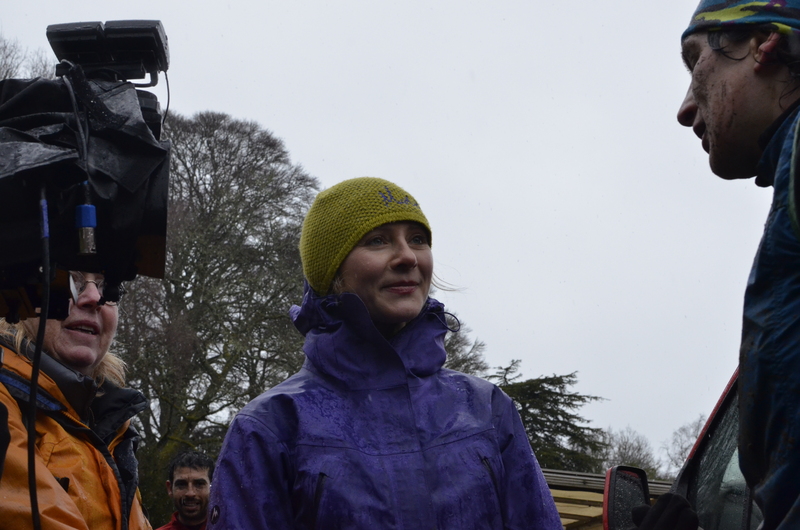 The final of the series is in February and The Adventure Show TV crew will be filming. Just a bit of added pressure! 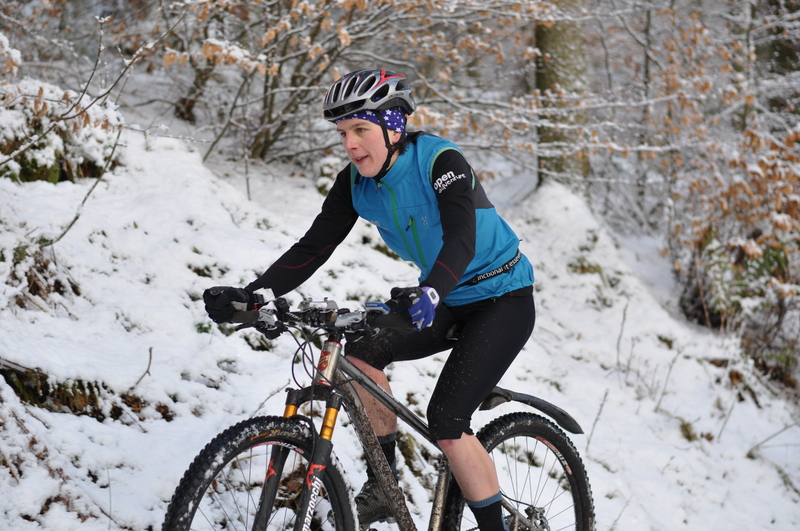 Thanks to Durty Events for putting on such a fun race again, and to Andy Upton at Zupix for the photos. After 6 hours of hilly, off road riding on Saturday, I woke up from a good sleep on Sunday morning. The sun was shining and I was ready for more! 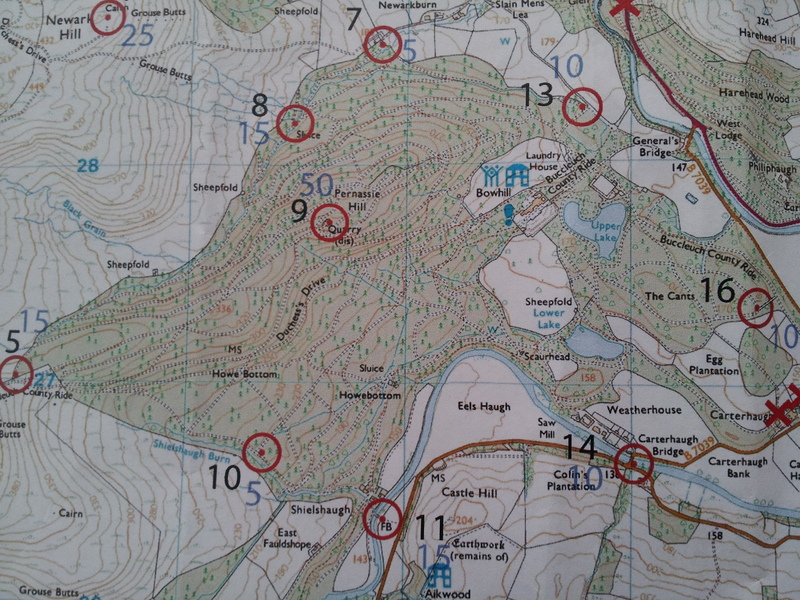 What I had in store was a 3 hour MTB score orienteering event. As I had been ‘staying with the organisers’ I knew they had worked hard to make sure the control checkpoints were accurately placed and marked on the map, and they had done a lot of pre-riding. I was looking forward to a good event. I was joining forces with Jon, who is one of my teammates for the 5 day expedition race in August, called Itera. We haven’t raced together for 3 years though we’ve shared a few long car journeys since then! The map was printed on A3 paper, which is quite large and means you need to refold once or twice during the race. This was because it was on a 1:25k scale. This is a bit unusual for MTB events, but definitely necessary for navigating the intricate maze of tracks on the Bowhill estate. As usual (for me), we set off at the latest possible time. 200m later we made a slight mistake, but hoped that would be our only navigation error for the day! It was soon righted, and we find ourselves riding along a fun trail through the trees alongside the river. The controls came quickly enough as we skirted round the edge of Bowhill, picking out a route that was easiest to follow. My legs were complaining a bit from the day before, and I gratefully tucked in behind Jon as we rode into a headwind. I knew I could carry on like this if we didn’t go any faster, of if my legs didn’t get any worse, but I was slightly worried I might not keep up 🙂 . After about an hour, we paused to consider our options. Time was passing faster than we had hoped and it was quickly becoming obvious we wouldn’t be able to get everything. In the end we stuck to the plan, looping round to the back of a big hill with controls worth lots of points at the top. Our alternative route still had all the climb in it, so it seemed best to carry on via the most number of controls. In retrospect, this took a bit longer than expected, but was definitely worth it for the views! Up by a gigantic cairn, we could see for miles and miles all around. The route up had all been entirely rideable and was quite rewarding. 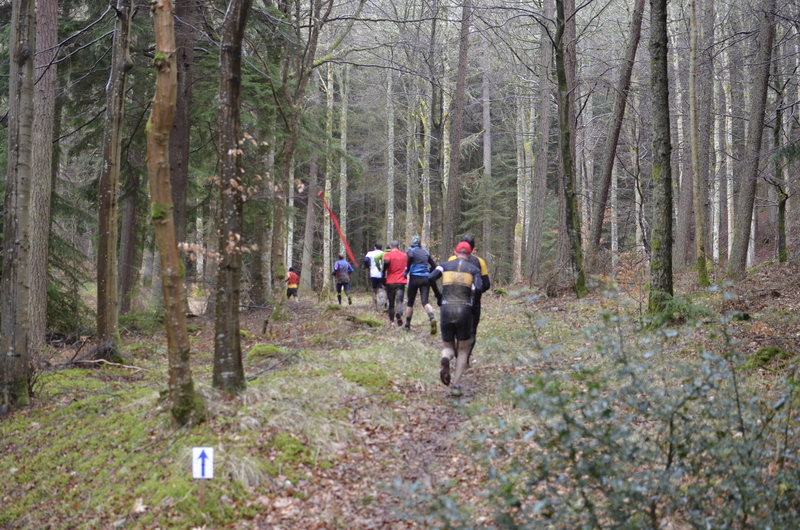 From there, we passed a milestone with a control attached to it and started a fabulous fast descent back to the forest. We got straight to the highest scoring control of the day, in a small quarry in the middle of all the criss-crossing tracks. Getting out was a little bit trickier, but we escaped without incident! 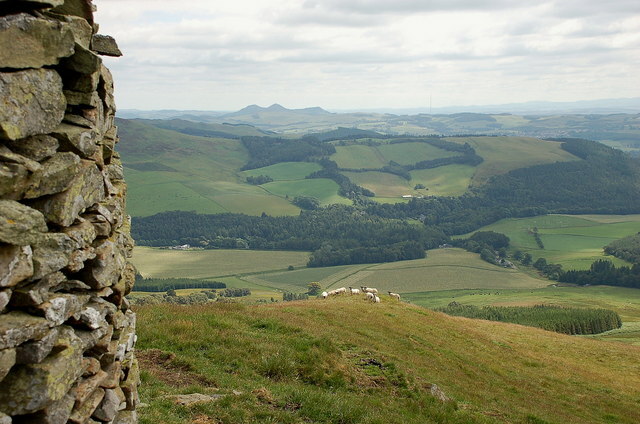 One of the views from the cairn. As we turned onto a minor road, we realised we had only half an hour left and were heading in the wrong direction for home. An about-turn saw us considerably shorten the route, dropping more 25-point controls than we really wanted to. My legs got a new lease of life as well – and suddenly it was Jon who was working hard to keep up instead of the other way around! Unfortunately, the final kilometre along the Borders Abbeys Way was not nice easy double track as suggested by the map. Instead, it was grassy, slidy, bumpy and punctuated with numerous stiles. Progress was much too slow! We skidded back to the finish nearly 9 minutes late. It was enough to win the mixed pairs, but only just! Marc and Ewan planned a very good event, with some challenging decisions to make about where to go, great riding (and not just a repeat of yesterday’s routes) and awesome homemade cake to finish off with. I was happy 😀 . 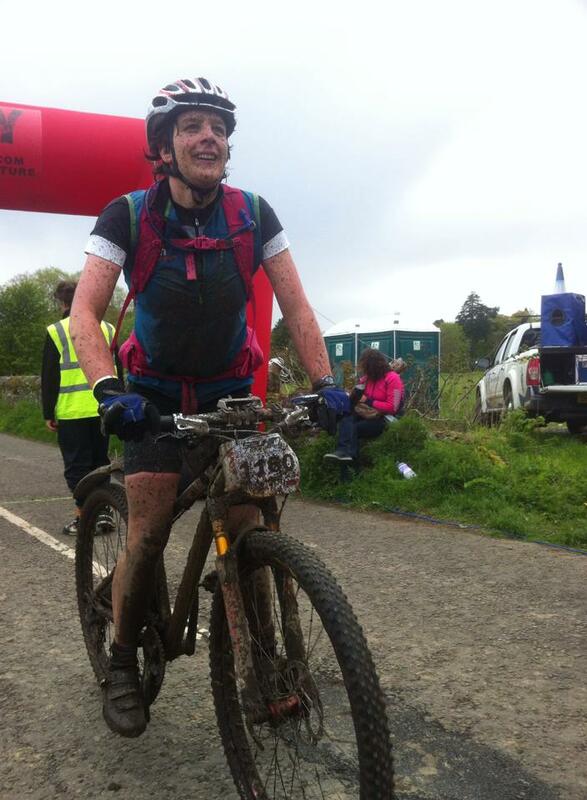 On Wednesday the week before the Selkirk MTB marathon I fell into a metaphorical hole. My ride to work felt laboured and the easy lunchtime run might as well have been a hard race. Thursday was no better; I missed out the end of our running intervals session and wrote ‘felt bad’ in my training log – two things that never normally happen! I took emergency measures. I went to bed early on Thursday night, took Friday off work and spent the morning packing for the weekend, cooking up snacks and generally getting on top of a few things. Marc and Ewan picked me up at lunchtime and we headed down. Although we didn’t need to arrive so early, it meant we got our pick of the camping spots and I had a wonderfully relaxed lead in to the event. 30 seconds of high speed racing on the rollers against Paul (organiser and Itera teammate) straight after I had eaten probably wasn’t wise, but I got over it! I think I might be sick! 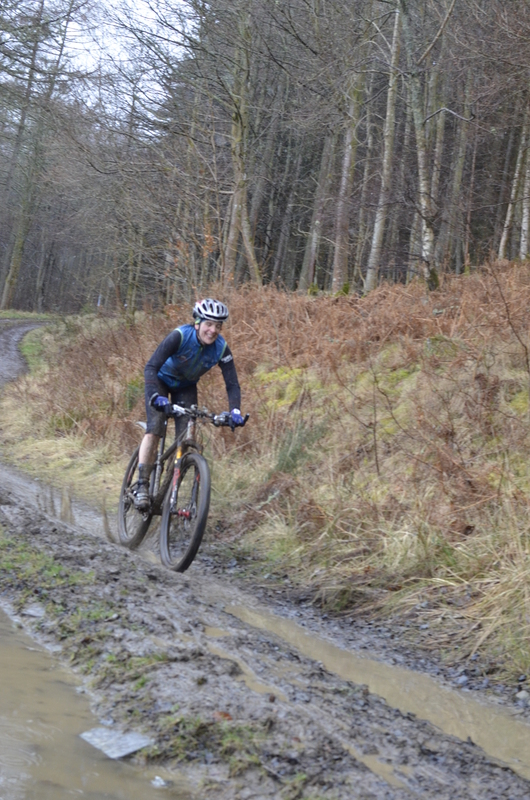 The Selkirk MTB marathon incorporates the British MTB championships, as well as offering a sportive version of the full course and two shorter options as well. I had only entered the sportive, as I didn’t want to pay extra to upgrade my British Cycling membership and buy a race licence just for this one event. However, I was keen to get into a good position at the front of the rest of the riders as we rolled out of the town centre. The ‘racers’ get a short headstart and were already out of sight as we turned into Bowhill estate, off the roads and onto the first climb. The route for this is course is amazing and I really recommend it! Almost all of it is off road, there are 4.5 big climbs and there is a mix of fire roads, moorland paths, built singletrack and muddy natural stuff. 75km of riding, 2100m of ascent. I dibbed in and out for the timed enduro sections, but I’m not sure why as I really didn’t enjoy them and fell off on the first one, quite badly bruising my inner thigh and knocking my confidence a bit. On the second one I decided it was quicker and safer just of get off and run down! After 35km and two climbs I was beginning to feel a bit weary. Goodness me – we weren’t even halfway! Luckily, I caught up with my friend Caroline here and we rode along chatting for a bit. She needed to stop and stretch, but just after that I hit a singetrack switchback climb through the forests, which I really enjoyed. During the ride / race my plan was to work at a hard but sustainable effort throughout and to play it smart. This meant out of the 4 feed stations I only stopped at the third (to refill my empty Camelbak bladder, eat a banana and reorganise my remaining snacks). That took 7 minutes and my gps showed I was stationary for 15 in total. My guess is some of those were when I was reduced to pushing up one of the steepest hills too slowly, or when I was busy falling off! I overtook a lot of people at the first two feed stations, most of whom didn’t catch me back up. I was also testing out some more feedzone portables. For the whole race I only ate these and a banana and drunk water. I think it was a successful combination! This weekend’s portables were: banana and walnut almond milk pastry mini pies (slightly under-done, but tasted good nonetheless), spinach and courgette frittatas (a well-tested favourite) and peanut butter and raspberry jam sandwiched between layers of sticky rice. These last were new to me and I was unconvinced at first. 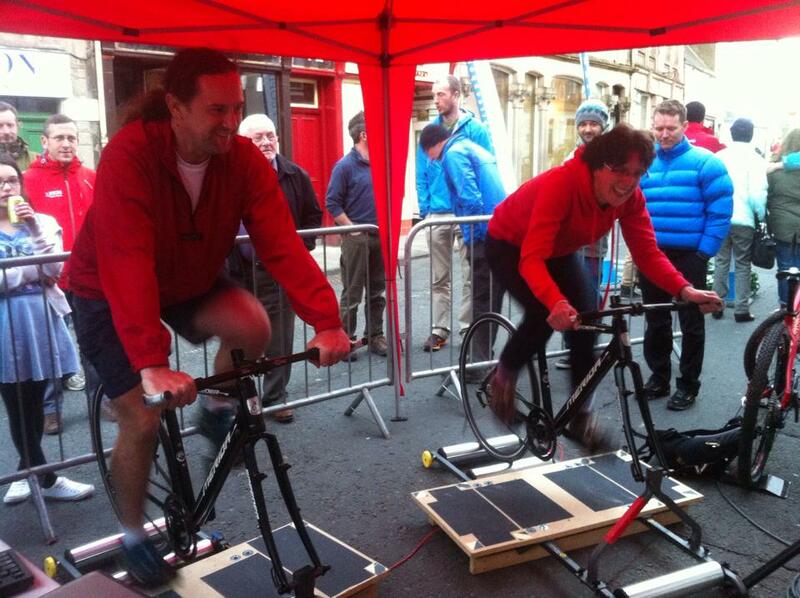 However, during the race they were fantastic! Salty and sweet, sticky and easy to eat. The also didn’t need an oven to cook, so were quick to prepare. Just finished – tired or happy? Although my descending is passable (compared, say, to a roadie ha ha! ), it is by no means up to the standard of most of the girls there. This meant I caught people on the climbs and was passed on the downhills. By the time we got to Innerleithen at the bottom of the last big climb, we had done 51km and I was beginning to feel a revival. As I’ve said before in this blog, the climb up to the top of Minch Moor is one of my favourites. I started with a few other people and as we powered up I lost all but one of them, and caught a couple of others. They paused to take in the views at the top (and they are worth taking in), but I was on a mission. My legs were feeling good now and with the incentive not to get caught, I sped along the Southern Upland Way until the final descent, which I’m sure I took faster than I normally would! Zooming under the finishing arch in top gear, I was all smiles 🙂 . This event wasn’t one of my targets and was more of a test / training run for Itera in August. After the way I felt Weds and Thurs I was actually pretty pleased with how I rode and how the eating plan went. Out of a combined total of about 30 girls who did the long course (race or sportive) I was firmly middle of the field with the winner nearly 2 hours quicker than me! A reminder that there’s always plenty of faster people. One final note. Marc and Ewan were the best support crew ever. They were there to organise the SMBO event on Sunday. As well as driving me down on Friday, they: adjusted my suspension forks (rebound and sag), helped check my brake pads, let me sit in the van while it rained, gave wise advice on clothing choices (short sleeve jersey and gilet, despite the forecast rain), lent me a big down jacket to ride up to the start in and throw back at them just before we left, were there as a welcoming party at the finish to say well done and take photos and, finally, stood in the slow moving queue to get my bike washed whilst I showered and changed. Awesome! 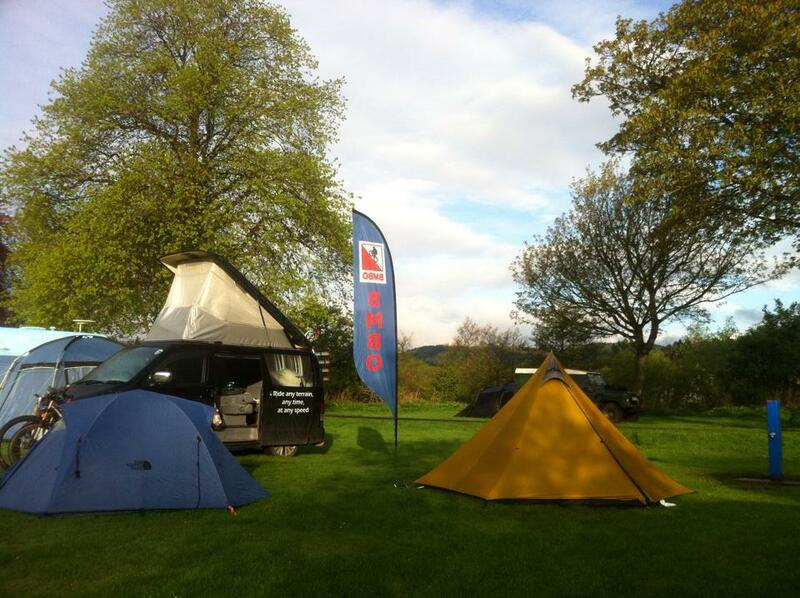 After an early dinner it was off to sleep ready for the next event – 3 hours of mountain bike score orienteering.